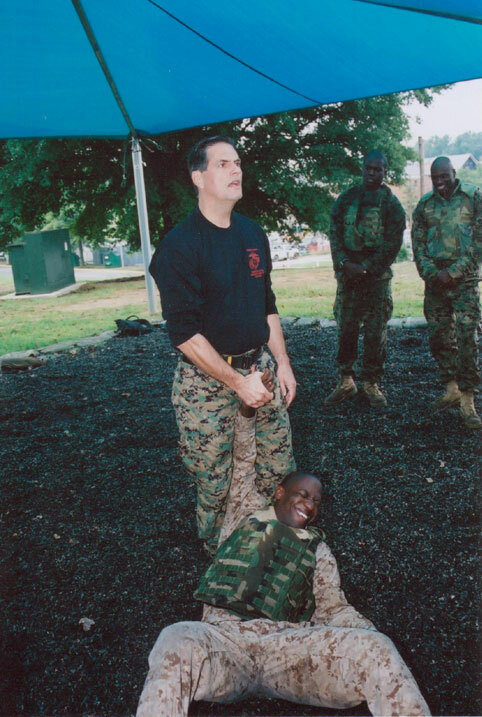 Jack Hoban Teaching the USMC at their base in Quantico Va. The following article is featured in www.PoliceOne.com. It was written by Jack Hoban and Bruce Gourlie, two talented professionals that I have the pleasure of working with. Jack's organization, Resolution Group International (RGI) www.resgroupintl.com is a professional training organization created to address the needs of military, law enforcement and civilian organizations. I am proud to be a part of this organization and work with such high caliber instructors with the same vision: To make a difference in a very profound way. Ethics are moral values in action. We strive to be ethical because morality protects life and is respectful of others. It is a lifestyle that is consistent with mankind’s universal values as articulated by the American Founding Fathers — human equality and the inalienable right to life. As Ethical Warriors it is our duty to be protectors and defenders of the life value and to perform the unique and difficult mission of taking the lives of those acting immorally (against life) when necessary to protect the lives of innocent others. If you are interested in RGI Ethical Warrior training opportunities, please go to: www.rgi.co/courses. Where to begin?! I was just sitting in Barnes & Nobles when I picked up a book called "Brains on Fire" and it hit me! I had a brief moment of clarity about a better way to communicate not only how I felt about my martial arts, conflict resolution & tactical training & teaching, but also why I chose this path in the first place and what YOUR part is in all of this is as well! Yes, that's right a clearer understanding on how to communicate what and why I train and teach! Now, trying to get it all in writing. My mind has been going a mile a minute since I sat down at B&N! I just hope I don't lose what I was feeling earlier before I can get it written down. Yes, the reason that I train & teach is to help others Live - Protect & Inspire themselves and others. As I write it down the words seem somehow hollow, like I've said that one million times before (probably because I have). So why did that sound so different when I was in B & N? Good question! Here it is; because this isn't about me, it's about all of us! I cannot do this alone, I need YOU, yes ALL of you to help. We all need each other really. None of us no matter how peaceful we are can live peacefully in a violent community. None of us are safe until all of us are safe. And to be honest, it isn't only about violence, it's about living a fulfilled life, one that enriches you and all of those people who you come into contact with. It's a ripple effect. This effect begins inside of each and every one of us. Ironically so does the conflict. I didn't pick up that book by accident any more than you are reading this blog by accident. We all have a story to tell. We all have things to share. We all have people we love. I am looking for some people out there who want to Live better, to Protect not only themselves but others too. What others? ALL OTHERS! Even those who aren't like you & you may not even agree with or like. Finally I am looking for people who want to learn how to Inspire others not through demands, but rather though example. Ignite Inspiration by creating a healthy environment that respects and protects all life. People who want to learn how to gain and keep their ethical true north and respond to actions appropriately and deal with conflict at all levels. We are a part of something much larger than our selves, larger than any class or workshop that we are training in. Each one of us CONTRIBUTES to the bigger picture in one way or another. I am looking for those who are ready to step up to the challenge of this mission, this cause, this underground movement, this underground rebellion to LIVE - PROTECT & INSPIRE ourselves and others. It was a good night; our Wednesday Krav Maga class was going well, everyone was sweating and training hard. We were working on frontal chokes while being pushed up against the wall. Leonard was having a difficult time getting one of the escapes to work, so he asked for help. After going over a couple of details Leonard said that he had it. Apparently he did, because a second later I hear a huge crash. As I turned to see what was going on I saw Leonard execute the escape perfectly on his partner Chris who had fallen forward with enough force to break through the drywall. The look on Chris's face was priceless as he picked himself up and out of the gaping hole in the wall. Now you may be wondering what all this has to do with my blog. Well, nothing really, I just thought I'd give a little introduction to Leonard Van Geldner who was kind enough to write this article for my blog. I've known Leonard for about 8 years or so now, he is a very talented martial artist and is a certified athletic trainer (ATC) and strength and conditioning specialist (CSCS) who has been involved in martial arts for over 19 years. He is currently finishing up his Clinical Doctorate Degree in Physical Therapy at Grand Valley State University. I asked Leonard if he would like to write up a article and after talking about how I am always on people warming up before class; it seemed appropriate that he would write about that subject. Leonard, thanks for writing out such a thoughtful article. I appreciate your insight. Hopefully it helps clear up some questions people have out there regarding stretching, injuries etc. Both Leonard and I hope that you enjoy the article and find it beneficial. By now, most of you have read about the controversies regarding warming up, as well as all the different types of stretching. From my discussions with individuals, I still detect hint of confusion in athletes when deciding what to do before, and after, training or competition. And unfortunately, there is a vast amount of outdated and inaccurate information available on the internet regarding the topic. Science obviously isn't the end all be all, and can be manipulated, however, it needs to be taken into consideration along with experience. My goal is to give a very brief overview of important research and then provide a practical application based on my experience and perspective. First and foremost, when we talk about stretching before exercise, what are we talking about? Although there are numerous forms of stretching, in general, pre-exercise stretching falls into two types of stretching, static stretching and dynamic stretching. Static stretches can be defined as slow, gradual, and controlled stretches held for a specific amount of time. Dynamic stretches are typically defined as active, functional stretching exercises that are sport specific to prepare the body for activity. To be honest, even though I'm a researcher in the area of stretching, I hate the term dynamic stretching. The terms dynamic warm-up, or "movement preparation", are much more appropriate, but for consistency sake I will stick with the term dynamic stretching. Secondarily, regarding injury, static stretching before exercise has never demonstrated a decreased risk of injury in research. Specific to the tactical athlete, a study of 1,538 male army recruits during boot camp demonstrated no difference in injury rates between one group that warmed up and stretched prior to activity, and another group that performed only a warm-up for four minutes (12). One study which has been claimed to demonstrate benefits of pre-exercise stretching actually did a better job of providing evidence for long term stretching and/or conditioning in injury prevention. Masatoshi Amako and his team followed 901 new military recruits over two years during basic training (1). These recruits were separated into one group that performed static stretching both before AND after training, while the other group did not perform any static stretching. Curiously, the static stretching group increased their injury rate over the first month, compared to the non-stretching group. But then over next three months, the stretching group had decreased muscle injury rates, but not bone, ligament, or joint injuries. This fits the idea that static stretching has long term benefits, but we have been unable to show them in short term in research. Previous studies on rowers and ballet dancers have also demonstrated that static stretching can play a role increased injuries (2, 8). Besides these individual studies, a number of critical reviews of available literature have concluded that pre-exercise static stretching does not reduce risk of injury, although perhaps long term use after exercise, or at different times, may help (14, 15). If there is anything that should be taken from this post is that people need to stop claiming that stretching before working out reduces the risk of injury. Other than anecdotal belief, there is no recorded evidence that stretching, of any type, performed before activity decreases risk of injury. It's even questionable whether warm-up does, although it is more plausible. It's important to consider that many comparison studies of stretching created one group that did no warm-up or stretching and then performed high intensity exercises without any recorded increased injury rate. So what does reduce the risk of injury? We have growing evidence that particular conditioning activities (prehab), rehabilitation, and long term stretching protocols over time appear to reduce risk of injury. But to date, nothing performed prior to activity has clearly demonstrated the ability to decrease a risk of injury or the reoccurrence of injury. Last, regarding athletic performance, static stretching prior to certain activities has demonstrated decreased performance in force production (7), sprint performance (13, 16), depth-jump performance, vertical jump height, long jump distance (5, 18), strength endurance (11) , and balance, reaction, and movement times (3). These deficits are not always present and seem to have some relation to the length of the stretch, starting with as little as 15 seconds. The deficits seem more apparent with powerful movements such as jumping and sprinting. However, taken into the context of the real world, some of the studied stretching lengths of over two minutes are not realistic. In addition, it is unlikely an athlete would not complete some form of sport specific drills prior to their sport after stretching, so it is important to take these results with a grain of salt. Dynamic stretching on the other hand, has shown improved sprinting performance (6, 9), leg extension power (17), agility performance (4, 9, 10), and improved long jump distance (5). There have been a small number of articles published on the topic of combining static stretching and dynamic stretching to possibly either remove the negative effects related to static stretching, or to further improve performance. To save time covering each, I will say that the results of the combined studies have been contradictory, although some evidence seems to indicate that performing a high intensity activity for few minutes after static stretching appears to restore performance to the level of the dynamic stretching groups. This shouldn’t come as a surprise, and as I mentioned earlier, this usually happens in most sports anyway. The real question to ask yourself is, how important is your time? Do you really have to do both static AND dynamic stretches when you get the same results from just dynamic stretching alone? Phew, ok, enough with the science, what does this mean to you, the martial artist/tactical athlete? To really summarize the application, although static stretching before exercise is not always associated with poor performance or increased risk of injury, it clearly does not reduce the risk of injury. Therefore you need to ask yourself why are you wasting your valuable time with it? Even if in a few more years of research we find static stretching isn't as bad for performance as some researchers and strength coaches make it out to be, it has consistently been shown to provide no additional benefits in comparison to dynamic stretching. Adding dynamic stretching after static stretching may remove some of the possible negative effects, but again, why are you using something just because it was "traditionally" thought to benefit you. Yes, we've been using static stretching for thousands of years, but we also thought the world was flat for how long? We can speculate a great deal, but if we have evidence for something better, why are we so resistant? Wasn't the concept of Jeet Kun Do or Krav Maga really about taking the useful but abandoning the wasteful? As tactical athletes in particular, isn't minimalism the key to efficiency and efficacy? Taken even further, when in a true "live" scenario are you going to get a chance to statically stretch let alone even warm-up? You're not, so why teach your body or your subconscious to fear potential injury from not adequately warming up or stretching? Yes, in training we want to protect our bodies from excessive abuse. However, beyond the research discussed above, it seems a better use of your time would be to focus on overall physical conditioning, some form of "prehab"/injury prevention training, and properly addressing past injuries. There are THREE exceptions in which static stretching prior to exercise may be necessary. First, in the case of a physical therapist or certified/licensed athletic trainer specifically prescribing a stretch, or stretches, designed to inhibit an overly active muscle. Second, if you are unable to properly or safely perform a technique without inhibiting that muscle with a "good" stretch. Third, not really practical to the tactical athlete, but possibly to a Wushu athlete, if the sport requires holding a static posture for any length of time that requires an extreme range of motion, static stretching is appropriate to prepare for that technique. In these examples, the potential "side effects" and additional time involved are more important in allowing you to perform proper technique or treat a chronic injury. Also, on a side note, if something hurts, have a physical therapist or athletic trainer look at it. It is possible the stretches you trying to use to make the pain go away could numb the pain (a whole topic in and of itself), but may be stretching important ligaments that need to be tight in order to protect a joint (very common with the back). It could also cause increase damage to the area by further tearing an already torn muscle or tendon. So we spent a lot of time talking about stretching before working out, what about after working out, or between workouts? This is where static stretching seems to possibly aid in injury prevention and even provide some performance improvements when performed over time. These benefits appear related to at least two specific changes from regular static stretching. First, static stretching clearly improves the range of motion of a muscle over time with regular stretching. We know that too little range of motion for your sport is an injury risk, so creating a more permanent change will be beneficial. Just remember, on the converse side, too much flexibility is also an injury risk. Second, much in the way that muscle grows and gets stronger with progressive micro-tears from resistance training, it appears that static stretching produces small tears in the fascia and muscle as well, which progressively heal longer and stronger over time. This is also why at times if you haven't stretched in a while and really stretch quite a bit one day, you feel a fair amount of soreness over the next few days, similar to a hard workout. Consistency is the key to maximizing these benefits, with at least 2-3 regular sessions a week, if not every day, and after every training session. So what about this dynamic stretching business, how do you use it in your training? Depending on interest, I may make another post with a general dynamic warm-up that can be catered to your needs. In the meantime, you can get away with creatively developing a warm-up specific to your training session. Start with a series of general callisthenic exercises such as bodyweight squats, pushups, lunges, and the like. Then slowly perform techniques from your style and progressively increase the speed up to your "game speed" as your body loosens up. Listen to your body! Start with simple movements and progressively increase the difficulty. Work both legs and arms, and take the most time and care with kicks. If something is particularly tight and you aren't familiar with a dynamic stretch for that area, make a static stretch dynamic. Slowly move into the position you would normally hold for a static stretch, but then immediately (but slowly) back out of the end position, holding it for no more than a second. With each repetition, slowly and painlessly try and increasing how far that position could be held. It's not rocket science, even though I know a number of professionals try to make it that way. It's important to keep it simple and straightforward, in general, 8-10 minutes in length will work for most, some need more, some need less, feel it out. That's stretching in a nutshell as we know it up to now, and a little of my biased opinion intertwined. From the perspective of a tactic athlete, static stretching before exercise isn't going to destroy you and the potential negative effects are negligible. So if you're absolutely fixated on doing it before training, go for it. I simply hope you take a moment to ask yourself why you are doing it. Dynamic stretching has benefits and can improve performance, but it's not a magic fix for poor technique or lack of strength and conditioning. Ultimately, it's important to keep in mind that your thoughts are extremely powerful, so if you think you're going to pull your hammy because you didn't statically stretch it before you exercise, you probably will. 1. Amako M, Oda T, Masuoka K, Yokoi H, Campisi P. Effect of static stretching on prevention of injuries for military recruits. Mil Med. 2003;168(6):442-6. 2. Askling H, Lund T, Saartok A, Thorstensson. Self-reported hamstring injuries in student-dancers. Scand J Med Sci Sports. 2002;12(4):230-5. 3. Behm DG, Bambury A, Cahill F, Power K. Effect of acute static stretching on force, balance, reaction time, and movement time. Med Sci Sports Exerc. 2004;36(8):1397-402. 4. Chaouachi A, Castagna C, Chtara M, Brughelli M, Turki O, Galy O, Chamari K, Behm D. Effect of warm-ups involving static or dynamic stretching on agility, sprinting, and jumping performance in trained individuals. J Strength Cond Res. 2010;24(8):2001-11. 5. Faigenbaum AD, Bellucci M, Bernieri A, Bakker B, Hoorens K. Acute effects of different warm-Up protocols on fitness performance in children. J Strength Cond Res. 2005;19(2):376–81. 6. Fletcher I, Anness R. The acute effects of combined static and dynamic stretch protocols on fifty-meter sprinter performance in track-and-field athletes. J Strength Cond Res. 2007;21(3):784-7. 7. Herda TJ, Cramer J, Ryan E, McHugh MP. Acute effects of static versus dynamic stretching on isometric peak torque, electromyography, and mechanomyography of the biceps femoris muscle. J Strength Cond Res. 2008;22(3):809-17. 8. Howell DW. Musculoskeletal profile and incidence of musculoskeletal injuries in lightweight women rowers. Am J Sports Med. 1984;12(4):278-82. 9. Little T, Williams AG. Effects of differential stretching protocols during warm-ups on high speed motor capacities in professional soccer players. J Strength Cond Res. 2006;20(1):203-7. 10. McMillian DJ, Moore J, Hatler BS, Taylor DC. Dynamic vs. static stretching warm up: the effect on power and agility performance. J Strength Cond Res. 2006;20(3):492-9. 11. Nelson AG, Kokkonen J, Arnall DA. Acute muscle stretching inhibits muscles strength endurance performance. J Strength Cond Res. 2005;19(2):338-43. 12. Pope RP, Herbert RD, Kirwan JD, Graham. A randomized trial of preexercise stretching for prevention of lower-limb injury. Med Sci Sports Exerc. 2000;32(2):271-7. 13. Sayers A, Farley R, Fuller D, Jubenville C, Caputo J. The effect of static stretching on phases of sprint performance in elite soccer players. J Strength Cond Res. 2008;22(5):1416–21. 14. Shrier I. Stretching before exercise does not reduce the risk of muscle injury: A critical review of clinical basic science literature. Clin J Sport Med. 1999;9(4):221-7. 15. Thacker SB, Gilchrst J, Stroup D, Kimsey D. The impact of stretching on sports injury risk: a systematic review of literature. Med Sci Sports Exerc. 2004;36(3):371-8. 16. Winchester JB, Nelson AG, Landin D, Young MA, Schexnayder IC. Static stretching impairs sprint performance in collegiate track and field athletes. J Strength Cond Res. 2008;22(1):13-9. 17. Yamaguchi T, Ishii K. Effects of static stretching for 30 seconds and dynamic stretching on leg extension power. J Strength Cond Res. 2005;19(3):677-83. 18. Young W, Elliott S. Acute effects of static stretching, proprioceptive neuromuscular facilitation stretching, and maximum voluntary contractions on explosive force production and jumping performance. J Sports Med Phys Fitness. 2001;72(3):273-9.